For your next adventure, come experience the excitement of rock climbing. 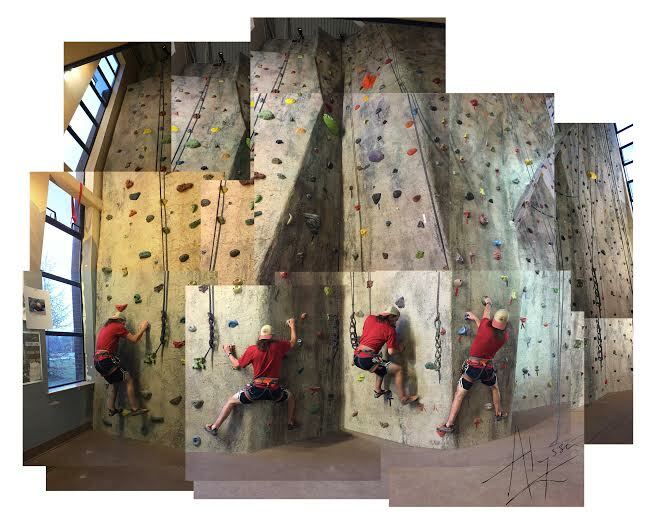 Our state-of-the-art rock wall is 37-feet-high and features 8 climbs for all abilities. 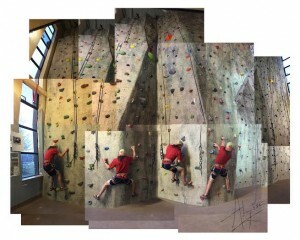 A bouldering wall provides an opportunity to challenge your climbing abilities. Our friendly staff is on hand to provide any assistance you may need. We provide all the equipment you will need to climb, including helmets and harnesses, free of charge. Climbing shoes are also available for a small fee. All other times by reservations – call (207) 768-9772 for availability and pricing. We post copies of all our forms on our website for your convenience. Rock Wall forms need to be completed before climbing at Gentile Hall Rock Wall. You may choose to fill them out before arriving. Please click here to view our forms. All users of Gentile Hall are required to have a signed Day User Assumption of Risk & Release OR a Membership Assumption of Risk & Release, with appropriate signature completed at the Front Desk, or a valid UMPI student photo I.D. All users must check in at the GHRW counter prior to using the climbing and/or bouldering areas. All users of the Climbing Wall will be required to sign an Assumption of Risk & Release Waiver for the Climbing Wall to be kept on file from 8/31 to 8/31 of current school year. All Assumption of Risk and Release forms must be signed by the parent or legal guardian of the child under the age of 18. Children under the age of 14 years, must be under the direct supervision of an adult 18 years or older. Please consult a physician before using any of our recreation facilities and/or equipment and before beginning a workout program. Tobacco, glass bottles, chewing gum or food (including candy) of any kind in the climbing & bouldering areas. Only unflavored water in a sports bottle is permitted in the climbing & bouldering areas. With the exception of chalk balls, loose chalk in any form is prohibited in the climbing wall for health and safety reasons. Climbing shoes and non-marking sneakers are required. Users should have footwear checked by GHRW staff prior to engaging in any activity. All roped climbers must wear harnesses. A figure eight follow through must be used to tie in. Spotters are strongly encouraged at all times when using the bouldering wall. Climbers using the bouldering wall must not pass over the top of the bouldering wall. All users must be aware of fall zones and avoid them when not climbing, bouldering and belaying. Climbers using their own equipment (harness & shoes) do so at their own risk. NO personal hardware (carabiners & ATC) allowed. Gentile Hall, in its sole discretion, reserves the right to disallow the use of any personal gear. All users are expected to help keep GHRW areas clean. Report all custodial/maintenance problems to GHRW staff immediately. Helmets are required to be worn by all climbers under the age of 18. Climbers 18 years of age and older must sign the Helmet Waiver to climb or boulder in the GHRW without a helmet. Shirts are required at all times. This is a family oriented facility, please wear appropriate clothing. Gentile Hall staff reserves the right to withdraw and/or revoke GHRW use privileges of any individual for breach of any portions of this GHRW Agreement, and/or for any unsafe or inappropriate conduct in the sole discretion of GHRW staff. Belay certification may be obtained from a Climbing Wall Staff member upon demonstration and completion of the belay skills checklist. For safety and security reasons – we ask that cell phone use to be limited to first floor lobby and second floor mezzanine. If coming in groups, we recommend calling in advance for availability of space and scheduling. For more information, check our Rentals page. Report any facility related injury immediately to the staff on duty. Report any facility/equipment irregularity to the staff on duty. General Facility Rules Poster is located at Front Desk.